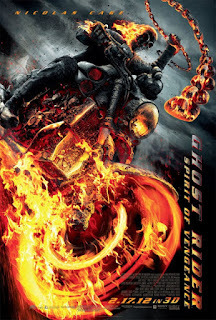 Chrichton's World: Review Ghost Rider (2007): Theatrical Cut versus Extended Cut. Review Ghost Rider (2007): Theatrical Cut versus Extended Cut. Ghost Rider has his moments but ultimately lets down. 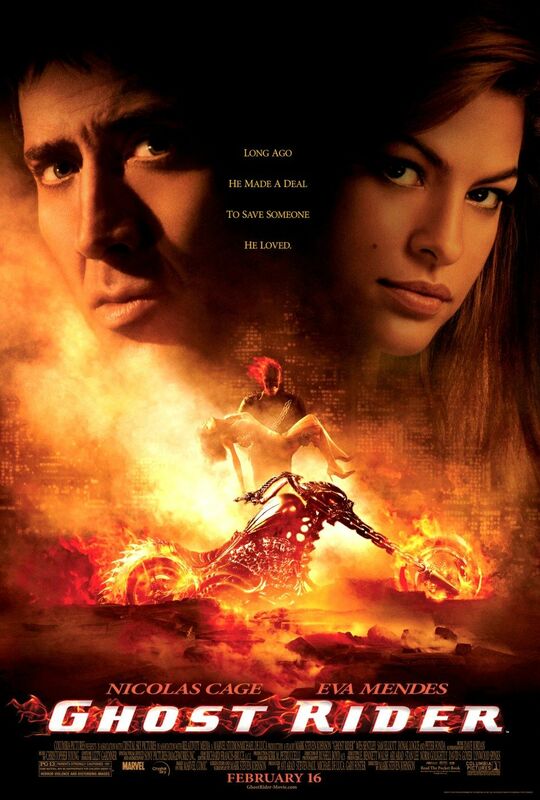 It takes too long for Nicolas Cage to become Ghost Rider. It is when Ghost Rider appears the fun really begins. The action and special effects are quite average though if you compare it to other marvel based movies like Spiderman and X-Men. I did like the story but somehow wasn't dramatic enough! I mean the young Jonny Blaze makes a deal with the devil out of love for his father. But his father only is on screen for three minutes or so. They should have expanded on this relationship so that the audience would care more about them. The same goes for the love of Johnny Blaze for Eva Mendez's character. It just isn't deep enough. And what about his reaction to the death of his best friend, Mac. He calls out his name and that's it. No moment of grief whatsoever. Check out underneath if the extended cut will improve things. The Ghost Rider has always been an impressive and mysterious comic book character. In the movie this mystery is completely gone. I think that some comics should stay untouched because most of them don't translate that well to the movie screen. Since the sequel also has failed to bring us a good Ghost Rider film. In the Extended Cut there is more emphasis on the characters and thus slightly improves upon the original when it comes to explaining who Johnny Blaze is. The scene with Mac is still the same but it now makes sense of why it's rushed. Since Eva Mendes has a more active role this time around we care more for her and it feels less forced for Blaze to rescue her. Such improvements might not be spectacular still any improvement no matter how subtle is good. All this extra focus on the characters does expose the flaws of this film even more. One huge flaw is how lacking the action and the spectacle is. Now it takes even longer before events start happening and when they do they are over before you know it. I personally would have loved to watch Ghost Rider help out innocents a little more. (There is one time he does this and it is definitely one of the best and coolest scenes.) It beats the sequences of him fighting Blackheart and his goons. Actually I should say altercations because they are hardly fights. Still compared to the Nicolas Cage scenes any scene with the comic book persona is superior. Unfortunately there simply is not enough Ghost Rider in this movie which is criminal if you ask me. Another flaw is the fact that the villains in this story are quite boring. You would think that Mephisto and his son would be more imposing, ominous and evil. Both original and this cut fail to show how dangerous and evil they are. And if you have demons from Hell running around on Earth you better do your best to convince the audience why Hell and everything surrounding it should be feared. In the end the extended cut does not really improve that much on the original. I don't think you will miss out if you only have seen the Theatrical Cut. If you want a detailed description of the difference between the two cuts then check out the link underneath. Detailed comparison between Theatrical Cut and Extended Cut.